There was an October’s worth of weirdness along the way: Kansas City’s five-run eighth in Game 4, the never-to-be-topped seventh inning that sealed Toronto’s Game 5 win, 6-foot-10 Chris Young facing 5-foot-6 Jose Altuve. But by the final outs on Wednesday, both up-and-down division series had led to the likeliest outcome: a best-of-seven matchup between the American League’s top two teams, the dominant-run-differential Blue Jays and the ALCS-regular Royals. For once in a season of upsets and surprises, the AL favorites did what we expected. So what did we learn during the ALDS? The first round was our most recent reminder that momentum doesn’t mean much: Texas went up 2-0 on Toronto before dropping three straight, and Houston was six outs away (with a four-run cushion) from eliminating Kansas City before the Royals came storming back. We also got a sliver of insight into two aces: Johnny Cueto isn’t the lost cause he looked like down the stretch, while David Price is more of a cipher than he seemed to be when the postseason started. So which former victim of a depressingly long but recently broken playoff drought is better positioned to take the 1985 ALCS rematch? In accordance with playoff preview custom, let’s break it down. Tom Pennington/Getty Images David Price pitched out of the bullpen in Game 4 of the ALDS, raising questions about his status. Even against a good Texas offense, Marcus Stroman recorded a 55 percent ground ball rate while allowing only three walks in 13 innings, overcoming early hiccups in both of his starts. His breaking balls defy classification, but they defy hard contact, too. He also oozes the bulldoggedness and ferocity that scouts describe as “mound presence,” which may or may not enhance his effectiveness but undoubtedly makes him one of the most entertaining arms on any of October’s surviving teams. Stroman pitched from behind from the third batter on in Game 5, but viewers wouldn’t have known it from his demeanor, which was save-situation intense for six innings. Because Stroman started Game 5 and the teams get only a one-day breather between series, he won’t be back until the ALCS is well under way. That lines up Marco Estrada to start Game 1 against Edinson Volquez, whom Josh Donaldson described as “some pretty good hitting” during the teams’ August feud. Estrada’s elite hard-contact-suppression skills held up against Texas in Game 3, and while his soft-tossing, fly-ball balancing act is a difficult profile to sustain at this level long term, his finesse mojo is working well for now. He’s used to pitching in a home run haven, but it won’t hurt that the Jays start this series in Kauffman Stadium, home of MLB’s largest outfield. The corner pieces of the ALDS David Price puzzle still refuse to fit, but regardless of why Jays manager John Gibbons went to his ace in the fifth inning of Game 4 while up by six runs — a lack of confidence in Price, an excess of confidence in Stroman, an extreme antsiness about nailing down a win with Texas lefties coming up and no southpaw in the pen — the unanticipated starter swap leaves Toronto in position to deploy its big-name ace before Kansas City can. It’s hard to imagine what a pitcher with Price’s track record could have done from a performance perspective between his Game 1 start and his Game 4 relief outing to deserve a demotion, so either he isn’t 100 percent — in which case it would make sense to worry — or we’re making too much of one curious managerial move. In other words, we’ll know more tomorrow night. As I noted in my ALDS preview, R.A. Dickey has looked like his Mets self (Cy Young season excluded) for some time. Including his postseason start from last week — his first ever, at age 40 — he’s made 34 starts this season. Split that sample in half, and he has a 2.75 ERA (with only two unearned runs) in the last 17. Aside from Price, Toronto’s starters don’t miss many bats, and they’ll miss even fewer than usual against Kansas City’s contact-oriented lineup. 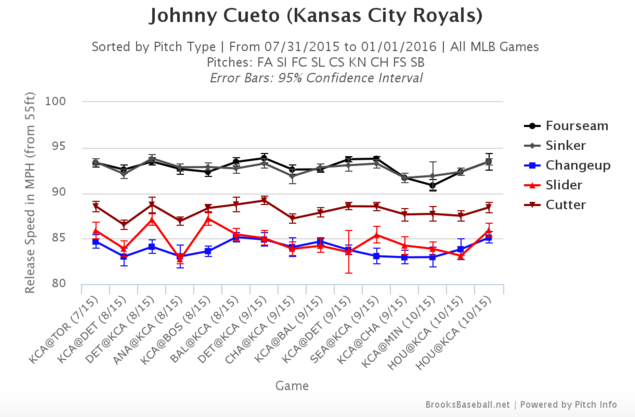 After bottoming out near an average of 90 in his last regular-season start, Cueto’s fastball bounced back to 93.5 this week. He also traded most of his four-seamers for sinkers, throwing fewer of the former and more of the latter than he has in any start since last June. 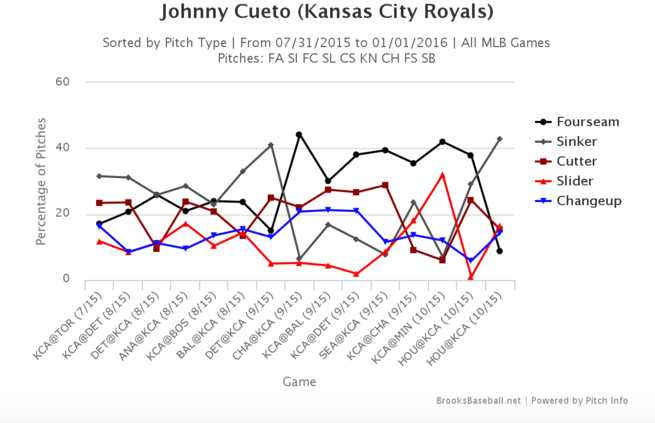 Cueto habitually tinkers from start to start (and from pitch to pitch), a quality that keeps hitters guessing and probably serves him well when his stuff is up to snuff. But given how much better he was Wednesday than he has been for months, sticking with whatever worked for him then would be the safest strategy for his next high-stakes start. Cueto refuses to work on short rest, so if he sticks to that policy he’ll make only one start in this series unless it goes to seven. The Royals avoided the Kris Medlen/Chris Young decision in the ALDS by bringing back Ventura for Game 4 after his rain-shortened Game 1 start. He wasn’t sharp in either outing, although he still missed bats — admittedly, not a tall order against the whiff-prone Astros. Young pitched well in relief in Game 1, while Medlen didn’t see action in the series. Since Game 4 will be a Rogers Centre start, Medlen’s ground ball edge over Young — who’s the Royals’ Estrada equivalent, a fellow extreme fly ball guy — makes him a more likely pick, assuming the Royals aren’t on the verge of elimination and forced to start someone else on short rest. On the other hand, Young has handled Jose Bautista and Donaldson well (a combined 4-for-32 with no homers), and managers love their matchup stats. Kendrys Morales and Russell Martin have injected life into their new teams’ lineups this season. The Royals proved tough to strike out in the ALDS, which is par for the course for the best contact team ever. They whiffed only 36 times, compared to the strikeout-prone Astros’ 58. We knew that the Royals would have the contact advantage in that series, but the Astros should have had sizable edges in power and patience. Instead, Houston walked only once more than Kansas City and hit just one more home run, which wasn’t enough to overcome the contact deficit. In a five-game series, even Alex Rios can post a .400-plus OBP. The Royals didn’t get much during the division series from Mike Moustakas and Eric Hosmer, whose hitting helped carry them through the playoffs last year, but they did get a big contribution from Salvador Perez, who was an offensive zero by this point last season (aside from his walk-off single in the wild-card game). What a difference a few more days off make! Either that, or Perez thrives on the restorative power of sleep deprivation coupled with some serious intestinal issues. The Royals and Astros were diametric opposites in strikeout rate, but the Royals and Blue Jays aren’t. As I wrote in my ALDS preview, Toronto’s offense achieves a highly unusual union of power, patience, and above-average contact. Even its sluggers don’t swing and miss. Toronto’s mashers played to their potential in the ALDS, with Bautista, Edwin Encarnacion, Donaldson, and Chris Colabello all posting OPS figures above .900 — as did Kevin Pillar, who finished the regular season with a .333/.368/.505 September/October line. Troy Tulowitzki entered the series as the lineup’s biggest question mark and did nothing to assuage anyone’s doubts, slashing .095/.174/.238. Between his subpar regular season and the potentially lingering effects of his cracked shoulder blade, it’s fair to regard him as something less than the brand name suggests, although his home run off Chi Chi Gonzalez in Game 3 showed that he still has sufficient power to punish mistakes. The Royals rotation is 100 percent right-handed, which helps counteract Toronto’s firepower to a slight extent, but despite the light left-handed presence in their lineup, the Blue Jays are baseball’s best-hitting team against righties, too. Ryan Goins is probably the worst-hitting regular in either lineup, but at least he doesn’t bat leadoff, as Alcides Escobar continues to do at Alex Gordon’s expense. (Esky Magic won’t have definitively failed the Royals unless they’re eliminated, but from a process perspective it failed from the start.) Goins is also good with the glove: Almost everyone in both of these lineups can pick it, so expect to see some pretty plays over the next several days, particularly in center, where Pillar and Lorenzo Cain will compete to complete the most out-of-zone plays for as long as the series lasts. Elsa/Getty Images Wade Davis has been exceptional for the Royals since last season and looms as a late-game threat. Wade Davis was his usual dominant self in the ALDS, and while the Astros drew blood against Ryan Madson, Kelvin Herrera, and Danny Duffy, the Royals have the deeper back of the bullpen and the better bullpen manager. Aaron Sanchez and Roberto Osuna are as imposing as any of the Royals’ non-Davis options, and lefty Aaron Loup — who was unavailable at the end of the division series because of a family matter — is expected to be back, which gives Gibbons one lefty option out of the pen other than his nominal ace. Southpaw Brett Cecil’s Game 2 calf injury, which will keep him out at least until the World Series, is a significant blow: The former closer entered the ALDS on a streak of 37 games and 31.2 innings without allowing an earned run, during which time he recorded an 11:1 strikeout-to-walk ratio. That’s a loss the Jays can’t replace without turning Price’s clock back to 2008, although Cecil’s absence hurts less in this series than it did against the Rangers’ lefty-susceptible sluggers. The Royals attempted only five steals in the ALDS, fewer than they did against the A’s in last year’s play-in game. The Jays made the same number of ALDS swipe attempts, and they were the better baserunning team over the full season. Russell Martin led the AL in caught-stealing percentage this season, throwing out 32 of 72 attempted thieves — a career-high 44 percent — so Kansas City late-inning speed threats Jarrod Dyson and Terrance Gore won’t have it easy when they take off in this series. Aside from pinch runners and injury replacements, the Royals bench should be invisible: Everyone other than their nine starters combined for two plate appearances against Houston, a reflection of their lack of bats off the bench and Ned Yost’s extreme aversion to making moves. Gibbons is more willing to pinch hit with his switch-hitters, using Justin Smoak against righties and Dioner Navarro against lefties. Tom Szczerbowski/Getty Images The Jays were the best-hitting team in baseball and could power their way to the World Series. Whether you’re more intrigued by a history of bad blood, bench clearings, and hitters being called babies or a showdown between the league’s two most talented teams, the ALCS should deliver. Although the series wasn’t decided until the final few innings, Blue Jays–Rangers was the biggest talent mismatch in the first round. The gulf here isn’t as great, and the Royals’ home-field advantage narrows it slightly more. But based on their regular-season run differential, overpowering offense, and dramatically upgraded second-half pitching staff, I thought the Jays were clearly the AL’s best team when the postseason started, and the nature of their victory over the Rangers hasn’t changed my mind. Cueto’s single-start revival makes the Royals rotation more imposing than it seemed when he was struggling, but Toronto has the bats to dismantle anyone else in the group except an on-point Ventura. The Jays, meanwhile, are better equipped than any other team to bang out a few early runs against K.C.’s starters and turn the Royals’ late-inning arms into assets that can keep a game close instead of assets that can end it early. Toronto in six. This article has been updated to correct the number of runners Russell Martin caught stealing.